Are you unhappy with the way your teeth look? Maybe they are crooked and you wish they were straight or maybe you just don’t like the alignment of them overall. At Access Dental Care, we are here to help you love your teeth and smile once again. We offer Invisalign in our office and if you are interested in this treatment option, call our office now to schedule a consultation! When you think of treatment options to straighten your teeth, you likely think of traditional metal braces. Many adults who never received orthodontic care as a child will need an intervention in their adult years to straighten their teeth. Many patients are afraid to have their teeth straightened because they do not want to wear metal braces. Invisalign is the solution to that problem. In fact, Invisalign is clear and no one will even know you are wearing the product unless you tell them. You may be wondering what exactly this Invisalign is at this point and we will tell you. It is a clear aligner system that works to slowly place pressure on your teeth to align them and straighten them. The aligner is custom made to fit in your mouth. This option is chosen most often because it is functional and you can remove the aligner when you need to eat and brush your teeth. If you are interested in Invisalign, you will need to schedule an appointment with one of our dentists. When you come into our office, your dentist will go over the treatment process with you and explain all information about the treatment. At this time, your teeth and mouth will be checked to ensure that Invisalign is the right option for you. If you have any underlying conditions, they need to be addressed BEFORE you receive Invisalign. 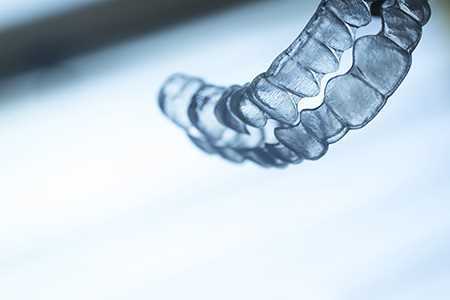 Once it is determined that you can have Invisalign, your treatment plan will be created, which includes going over how many aligners you will need, having impressions of your teeth made, and creating an image for you to see that will give you an idea of what your teeth will look like after treatment. Once your aligners come back from the dental lab, you will come in for an appointment to have them fitted and ensure that they feel comfortable. You should wear the aligner for a minimum of 20 hours per day, but can wear them as much as you want over and above that. Your aligners will be switched out every two weeks or so until you reach the end of the treatment period. You will be able to see your results each week as you move closer to having straight teeth. If you are interested in Invisalign or you want to talk about your teeth straightening options, call Access Dental Care today. We will schedule you in for an appointment with one of our experienced and skilled dentists. Let’s smile together!